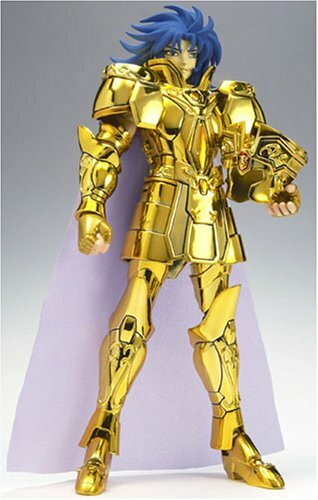 From anime and manga Saint Seiya (Caballeros del Zodiaco), this is Saint Seiya : Gold Cloth Gemini Saga Action Figure . 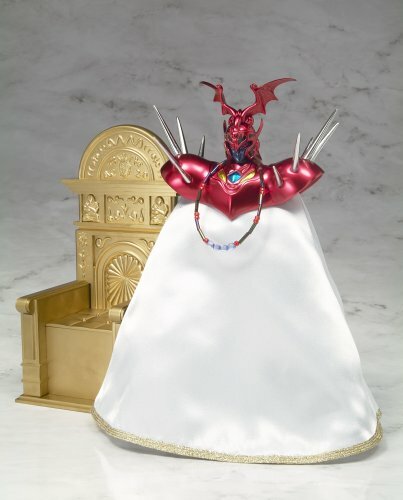 This Gemini Saga figure come with interchangeable head parts for recreation of good, evil and shadow personalities, as well as parts for portrayal of Pope Ares are also included. Removable armor parts, and parts for object assembly included. 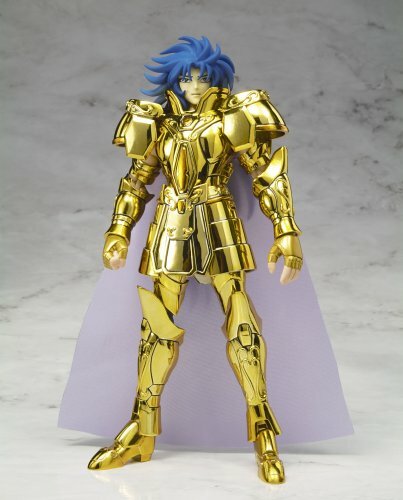 Gemini Saga (双子座のサガ, Jemini no Saga) is perhaps one of the oldest Gold Saints of his generation at the age of 28. Before the events of the conspiracy, Saga was often regarded in Greece as a kind, generous soul loved and he was by many, earning him the alias of “the Demigod.”, and described as extremely beautiful. Unknown to most people in Sanctuary, there was an evil side lurking within him, one that Saga had struggled to suppress for years. Of course, only his twin brother Kanon knew about this, what later was the reason why Saga had Kanon imprisoned in the dungeon at Cape Sounion when Kanon suggested that Saga should embrace the evil. However, after Kanon’s imprisonment, Saga had only became further corrupted by the evil within him. Along with fellow senior Saint Sagittarius Aiolos, Saga was summoned by the Pope Shion for a meeting to decide the successor to the throne. Due to the fact that most of the Gold Saints were too young at the time for this responsibility, the choice fell upon Gemini Saga and Sagittarius Aiolos. The exception was Dohko but he was in charge of watching the seal of Hades therefore he could not leave the 5 peaks Mountain in China. Unfortunately for Saga, Aiolos would be the one announced to take the seat and lead the then infant Athena towards the path of gvirtue. This news did not please the Gemini Saint, and it brought him to an eventual confrontation with Shion. Saga’s most destructive special attack is known as Galaxian Explosion (ギャラクシアンエクスプロージョン, Gyarakushian ekusupurōjon), a devastating burst of Cosmo that is said to be capable of smashing stars, and easily annihilates one or several opponents in an instant. Saga also counts in his arsenal Another Dimension (アナザーディメンション, Anazā Dimenshon), which allows him to bend space and time itself provoking a rift or a passageway to an alternate dimension, a expansion of time and space, intending to push and trap his opponents inside to wander forever after he has done this. An added fact about this particular move is that Saga can launch this at great distances, coupled with a very vivid illusion of himself wearing the Gemini Gold Cloth, Saga thwarts the opponent into believing that he is in the given location performing the move, when in reality he might be miles away from the actual fighting ground.